After being inspired by a recently-discovered-by-me fellow blogger Attic24, I decided I needed to add in yet another project to my current list of unfinished objects. And after a long, dark, cold, and windy Alaskan winter, this project needed some color. So, I invaded my stash of Noro Kureyon that I've been collecting for awhile, with no good idea of what I would ever do with it all. All told, I have about 35 skeins of all different colorways. After reading Attic24's blog on Friday, I finally knew exactly what to do with it all. 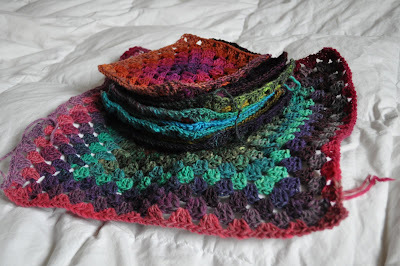 For the most part I would consider myself a knitter, with a few brief forays into crochet. However, my knitting projects have been overwhelming me lately (why did I choose so many at once that are mostly stockinette--torture!) so I thought it was time to switch it up and throw in some granny square action. 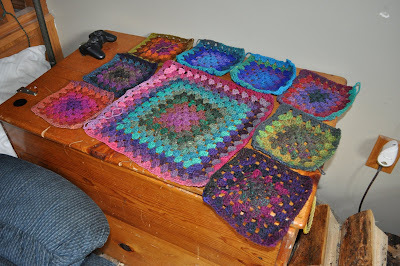 Given the self-striping nature of Noro, I knew making a granny square afghan with it would be the easiest way to achieve the crazy quilt variety of blanket that I have been looking to make. Even though we spent all of Saturday cleaning and rearranging our entire upstairs, I was able to finish about 1/3 of the afghan! 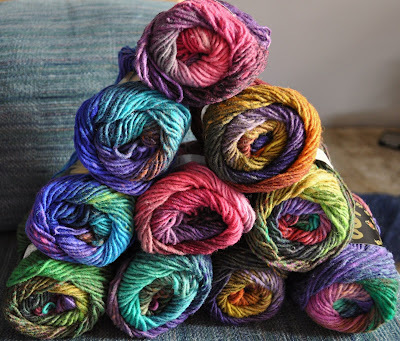 Here's a photo from my last post, put here to remind you of some the Noro colors I'm using. Here are some shots of some of the finished blocks. I got many more blocks finished after I took these photos. 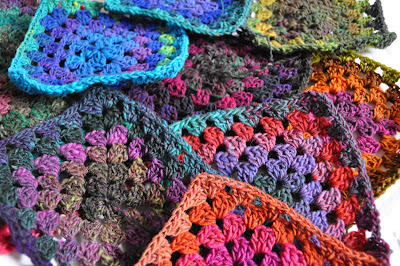 I think it will end up making a decent sized throw, one that I hope will find a home in our living room and brighten my day just by glancing at it. Hopefully I'll have this done in time for a local art show which will showcase all Skagway artists winter work. I love this! So colorful and pretty...it really does make me happy just looking at it! I'm also really jealous of your new camera! oh wow!!!! 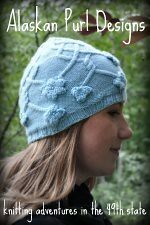 I am so bowled over by your Grannies made in this scrumptious looking yarn! 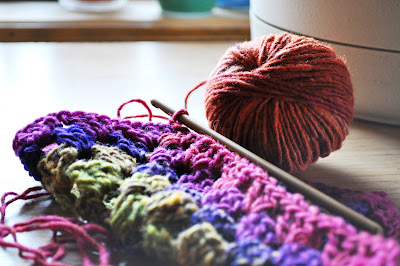 The blanket is going to be awesome, I can practically visualise it...lovely to see more and more hooky action spreading across the globe, makes me smile. A lot. there are news and interesting info on our website, judi online so visit our website so that you know interesting info from our website. besides there are other interesting features for you to see. quickly come to our website now. quickly come to our website now .